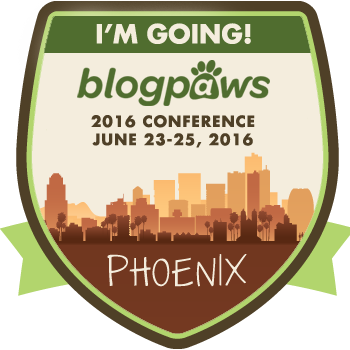 This post is sponsored by Merrick Pet Care and the BlogPaws® Pet Influencer Network™. I am being compensated for helping create awareness around the Merrick Classic Refresh, however we only share information we feel is relevant to our readers. Merrick Pet Care is not responsible for the content of this article. Sometimes it's good to make a change for the better or go for a more natural approach. I've been doing that as of late with my hair in letting it grow out long and natural, and by wearing a classic style with pretty, pink ribbons. Mommy loves my new longer natural hair style. It makes me feel pretty and attractive. She'll shower me with kisses and tell me I'm the "best dog ever". Of course she's told me that my whole life! 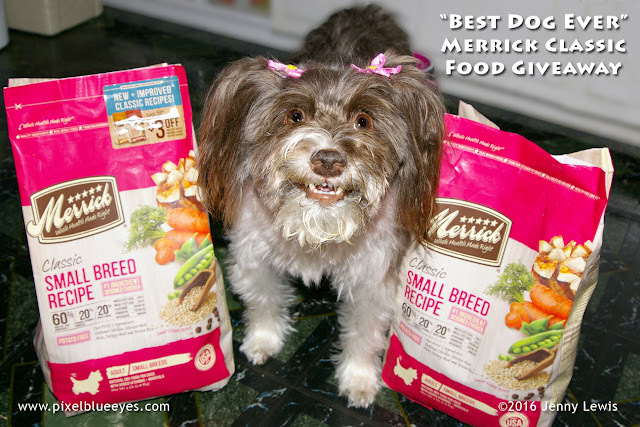 My friends at Merrick Pet Care believe in a more natural approach as well, when it comes to their Classic line of Dog Food and natural nutrition, and they've just done a fantastic recipe refresh for 2016 that you are going to love! Merrick Classic has long provided dogs with best-in-class natural nutrition from a wholesome balance of protein, wholesome grains and fruits and vegetables. Merrick Classic recipes now have been improved to offer an even more palatable and easily digestible mealtime experience for your "Best Dog Ever". These 5 new and improved recipes start with real de-boned meat as the very first ingredient to provide leading levels of high quality protein. It's then followed up by whole grains like Brown Rice, Barley and Oats, and fresh fruits and vegetables including blueberries, apples, sweet potatoes, peas, and carrots. 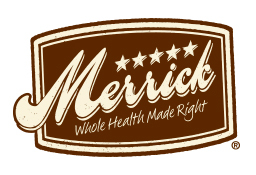 The Merrick Classic Dog Food line also contains no soy, wheat or corn, which are common allergy triggers. I wanted to really get "up close and personal" with this new recipe as I learned all about the yummy new enhancements they've made. It sure smells good! The Merrick Recipe refresh comes with new ingredients such as ancient grains like Quinoa and Chia seeds, which adds fiber, protein and Omega-3 to your dog's diet. They removed potatoes from some of the recipes, and have introduced smaller bite-size kibble pieces for very small breed dogs. There's also NO ingredients from China and it is proudly MADE IN THE USA! 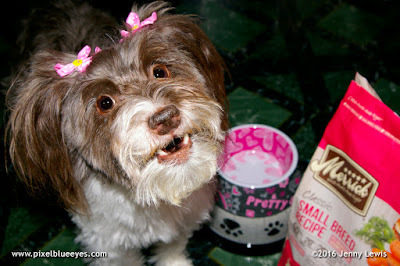 I'm also happy to share that these five new Recipes offer pet parents the same Wholesome Natural Nutrition that Merrick stands for at a new attractive price. And speaking of attractive, just like I have a new look, well so does Merrick's Classic line Dog Food bag. Just looking at the front of it, with all those images of food on it, makes me want to start eating the bag itself! Every dog is unique, has different tastes and different needs. Merrick considered all that when updating their recipes. Merrick has varieties available based on protein needs, life-stages, and breed size. You wouldn't give big breed dog food to a little dog, now would you? Of course not. Merrick's Small Breed Recipe for Adult Dogs is made especially for small dogs like me. 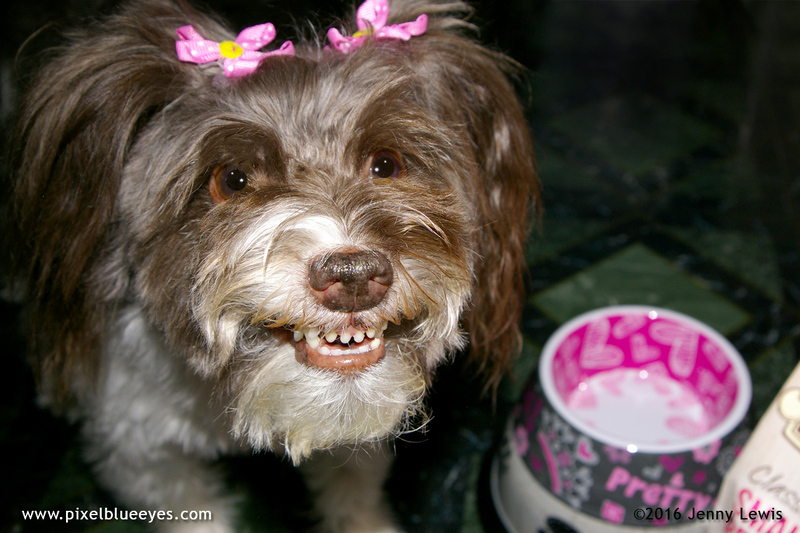 In fact, the kibble is so small and bite size, you could feed it to a 5 lb dog and they would easily be able to chew it without it being too big for them. See? My friends at Merrick have pretty much thought of everything. Let me tell you, it's also incredibly delicious!! And Merrick is a brand that I truly trust. My family has trusted them for years and you can too. 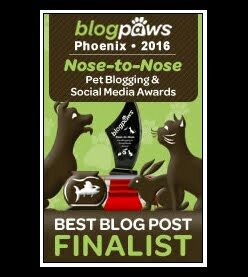 Doesn't your 'best dog ever' deserve the very best? Enter by April 2, 2016 to qualify to win. Learn more about Merrick and get social with them. They'd love to hear from you! This is a sponsored conversation written by me on behalf of Merrick. 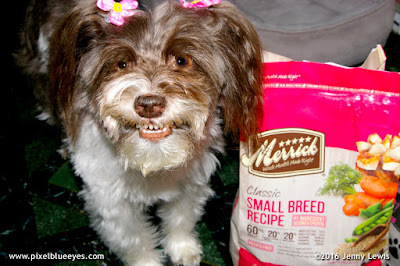 Sounds great Pixel - Sweet Pea and Baby would love to try the new Merrick dog foods!! Hi Mitzi! Merrick is a truly excellent food. I ate it for years! So please make sure you enter to win for Sweet Pea and Baby, okay? The link is near the end of the post. :) Good luck!! It sounds wonderful, Pixel! I have entered, and I hope Gaby wins a bag of the food. 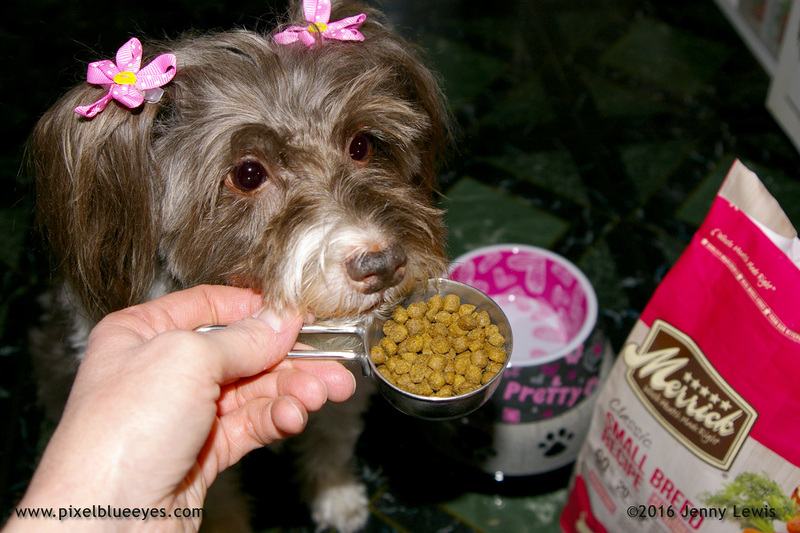 The small breed formula sounds perfect for her! Love you! It is a truly wonderful food Donna. I love the taste and I know Gaby will too! Love you my dear friend! Thanks for the info, Pixel. I'm going to Merrick. I have the pickiest dogs on earth. Sounds like they'll love it. You're welcome my friend! I think you'll be very happy with it. Thank you for the research, I love getting dogs point of views, I will give them a try. You are so welcome. I believe in doing good research for my friends and sharing my results...because a dog always tells the truth. 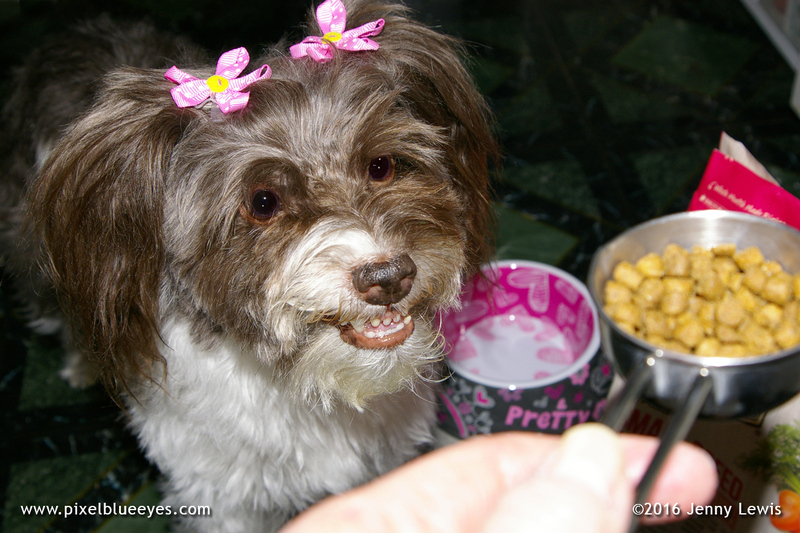 Pixel, with a spokesdoggie like you, how could we NOT want to try Merrick's doggie food! Thanks so much for trying it out and letting us know all about it, including how how nom nom it is. The 4 pack sends love and puppy kisses!! Awe thank you dear Anita! You make me blush. I am so glad I could try it out for my friends and tell you all about it especially since it is SO good! Give my love & Pixel kisses right back to your beautiful pup crew. Your big pretty smile says it all. Yum! Awe, thanks Jerry Dawg! You just made me smile even bigger! This is some kind of good food, so it pulled the smile right out of me. You must have such a fun time with all these little friends. enjoying your stories. Very cute honey, never stop with these very helpful ideas to share your love. The pony tales look amazing. The smile is very prominent there. The pup seems healthy. So, definitely the food is good.